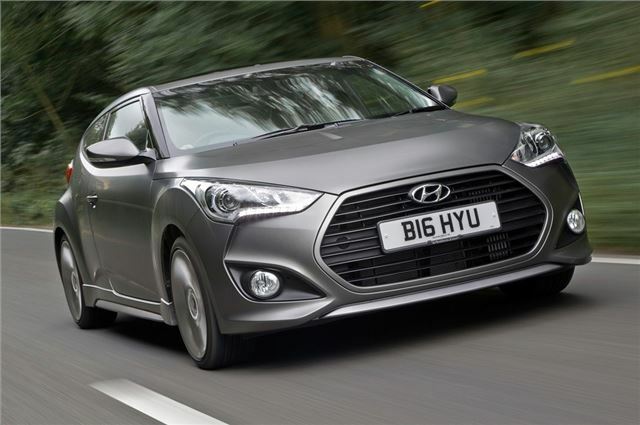 The new Hyundai Veloster Turbo goes on sale at the end of next month priced at £21,995. It's the first Hyundai to use the 1.6-litre T-GDI engine with a twin-scroll turbocharger, producing 186PS with 265Nm of torque. This gives it a 0-62mph time of 8.4 seconds - 1.5 seconds quicker than the standard Veloster - while the maximum torque peaks at 1500rpm up to 4500rpm meaning more response low down. It also gets firmer dampers to give improved body control and a quicker steering rack with revised calibration for more precision and better feedback. It's pretty economical too with a claimed average of 40.9mpg and emissions of 157g/km. To make it stand out from the standard model, the Veloster Turbo has a different front bumper, grille and front fog lights. At the back there's a redesigned bumper, including a new fog lamp design, plus round twin exhausts and a diffuser. There's a longer and wider rear spoiler with an integrated LED brake light plus new 18-inch alloys with chrome inserts. Three colours are available, White Crystal, Phantom Black and a Matt Grey finish. The Phantom Black and Matt Grey paints cost £445 and £525 respectively while a tilt and slide Panoramic sunroof is available for £950. Inside, there are redesigned leather seats with grey panels, while the driver’s seat is electrically adjustable with lumbar support. Other standard features include a 7-inch touchscreen satellite navigation system with a reversing camera plus an upgraded eight-speaker sound system with an amplifier and subwoofer. Too expensive, too ugly and only average capability.